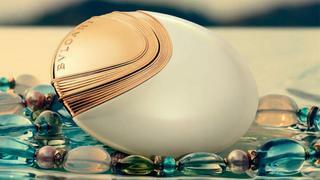 Italian fine jewellery and accessories house Bulgari have added to their extensive collection of fragrances with new women’s scent Bvlgari Aqva Divina. Created by master perfumer Alberto Morillas, the fragrance is inspired by the natural sunlight and flowers of the Mediterranean coast, featuring notes of salty bergamot, pink ginger and sunlit quince. Filmed in the Mediterranean Sea, the stunning campaign film makes the connection between the scent and its aquatic roots clear to see. An almost mermaid-like model is seen diving gracefully into the ocean, her neck adorned with ocean-hued gems, while a passing male looks on captivated by her beauty. How could anyone resist? Bvlgari Aqva Divina is available now as an Eau de Toilette spray and body lotion from Bulgari.